North Yarmouth Academy is a great place to work! North Yarmouth Academy is committed to the principle of equal opportunity for all its students, faculty, employees, and applicants for admission and employment. NYA does not discriminate on the basis of race, color, religion, gender, age, sexual orientation, national origin or ancestry, disability, or any other legally protected status in its programs, organizations, activities, and conditions of employment and admission. In addition, NYA provides reasonable accommodation to qualified disabled students and employees, and applicants for admission and employment, unless the proposed accommodation poses an undue hardship. Consistent with applicable state and federal rules relating to interscholastic athletic competition, NYA does make appropriate distinctions based upon age and gender of student athletes. 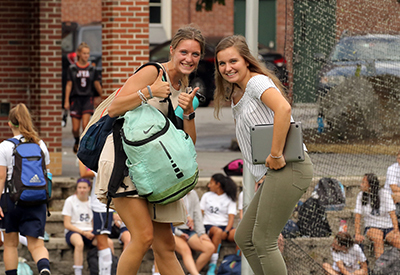 North Yarmouth Academy is committed to the principle of equal opportunity for all its students, faculty, employees, and applicants for admission and employment. For that reason, North Yarmouth Academy does not discriminate on the basis of race, color, religion, gender, age, sexual orientation, national origin or ancestry, disability or any other legally protected status in its programs, organizations, activities and conditions of employment and admission. In addition, North Yarmouth Academy provides reasonable accommodation to qualified disabled students and employees, and applicants for admission and employment, unless the proposed accommodation poses an undue hardship. Consistent with applicable state and federal rules relating to interscholastic athletic competition, North Yarmouth Academy does make appropriate distinctions based upon age and gender of student athletes.